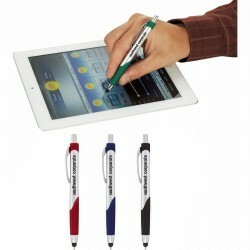 Scripto® Score Ballpoint Stylus Click Quickly alternate between ballpoint and stylus functions with this style. 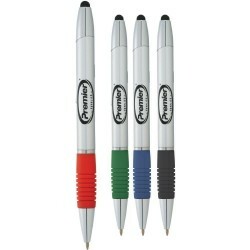 Soft rubber stylus is integrated into pen tip, small hole in center of rubber allows for ballpoint pen tip in blue ink to be exposed only when click-action mechanism is engaged. 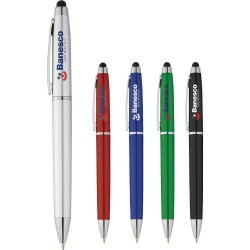 Scripto® Score Highlighter Ballpoint Stylus Score Highlighter Ballpoint Stylus makes it easier to navigate your mobile devices and important documents. 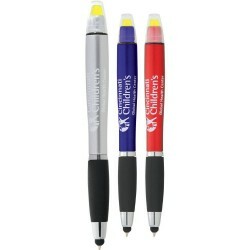 Specifically designed for a mobile tablet, iPad or iPhone, this lightweight model combines technology and function with the cap-off yellow wax highlighter. 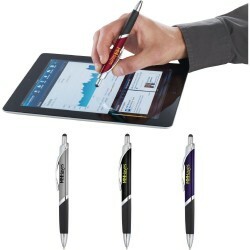 Nash Pen-Stylus with Crystals Twist-action ballpoint pen with soft rubber stylus for touchscreen devices. Add bling to your promotion with decorative crystals. 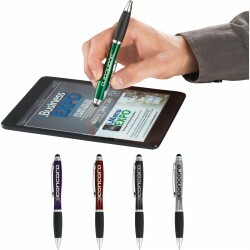 The Torino Pen-Stylus Retractable ballpoint pen with soft rubber stylus for touchscreen devices. 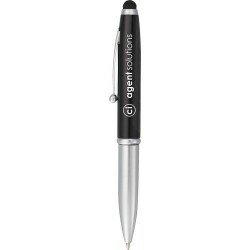 The Jaguar Pen-Stylus - Glamour Retractable ballpoint pen with soft rubber stylus for touchscreen devices. 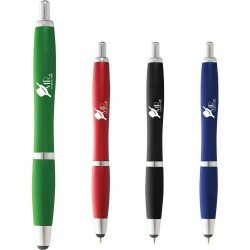 The Jaguar Pen-Stylus - Spirit Retractable ballpoint pen with soft rubber stylus for touchscreen devices. 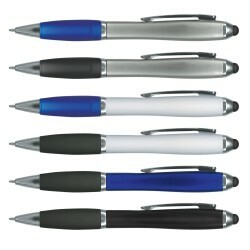 The Jaguar Pen-Stylus - Tradition Retractable ballpoint pen with soft rubber stylus for touchscreen devices. 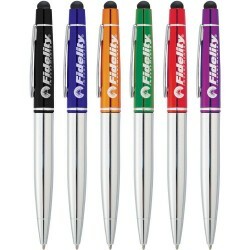 Twist-action ballpoint pen with soft rubber stylus for touch-screen devices. 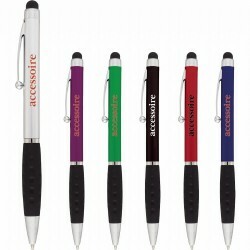 Retractable ballpoint pen with soft rubber stylus for touch-screen devices. 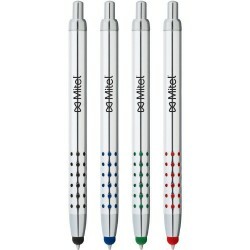 Scripto® Metallic Bubble Grip Ballpoint Stylus Quickly alternate between ballpoint and stylus functions with this style. 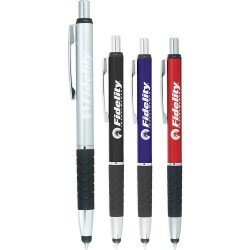 Soft rubber stylus is integrated into pen tip, with a small hole in center of rubber allowing for ballpoint pen tip to be exposed only when click-action mechanism is engaged. 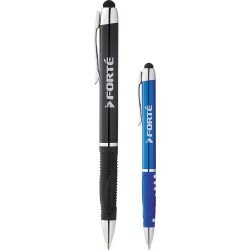 Scripto® Pinnacle Ballpoint Stylus Quickly alternate between ballpoint and stylus functions with this style. 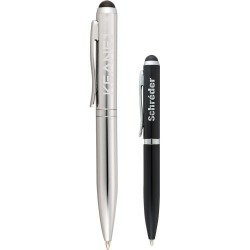 Soft rubber stylus is integrated into pen tip with stylus, allowing for the black ballpoint pen tip to be exposed only when click-action mechanism is engaged. 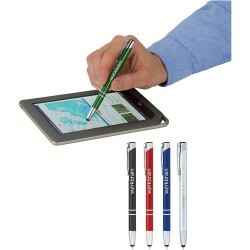 Compatible with any capacitive touchscreen device including iPhone and iPad. 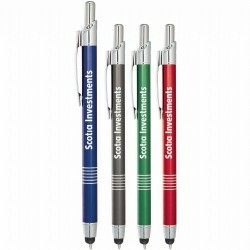 Scripto® Optimus Ballpoint Stylus Metallic Coloured barrel with shiny chrome detailing and black rubberized grip. Soft rubber stylus is integrated into the pen tip allowing ballpoint tip to be exposed only when click action mechanism is engaged. Ideal for iPad, iPhone, Blackberry, Android smartphones and mobile tablets. 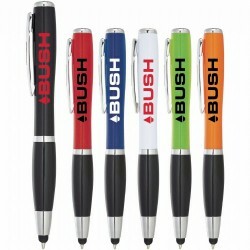 Multifunction plastic and metal twist action ball pen with a Black ink refill and a soft touch rubber lacquered grip. 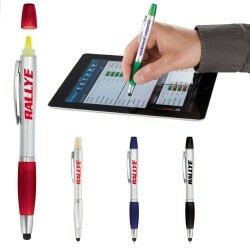 Has a stylus for use with touch screens and an LED light which uses one button cell battery which is included. A lead time of 10 - 15 working days applies to this product. 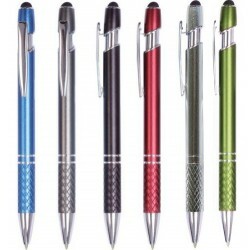 Metal stylus ball pen with click action and touch fittings. 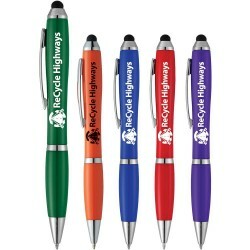 Sand anodized aluminum barrel with rings,solid black top, metal clip, polished plated trims. This top of the range 9-in-1 pocket tool incorporates a pen, stylus, 4 rulers, spirit level, phillips and flat edge screwdriver all in a useful stylus pen. Available in black, blue or yellow, all with silver trim. 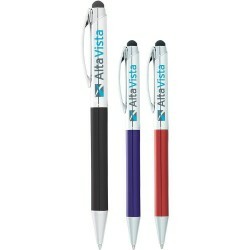 Ballpoint pen with 3 ink Colour options (Blue, Black, Red) and soft rubber stylus for touch-screen devices. Dual-function. Twist-action ballpoint pen and yellow highlighter. 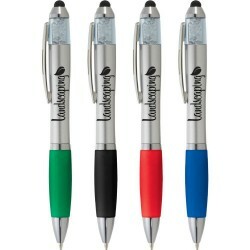 Includes soft rubber stylus tip for touch-screen devices. Luxury 80 page notebook complete with lined pages, a book mark ribbon and an elastic closure band featuring a unique logo strip. Has a hard cover with a stitched soft touch Antique Neoskin finish and a cardboard envelope on the inside back cover. 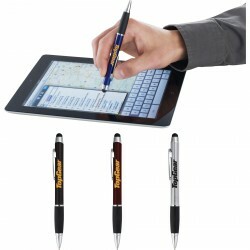 The Preston Dual Ballpoint Stylus combines a classic ballpoint silhouette with the added stylus function. Grip is artfully textured with chrome rings. 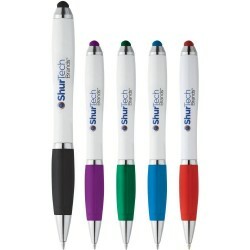 Retractable twist action mechanism with standard blue ballpoint ink cartridge. 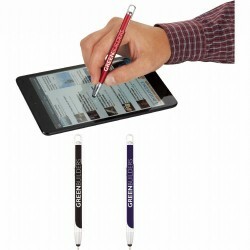 The Oxford Dual Mini Twist Stylus is the must have stylus for everyday use. 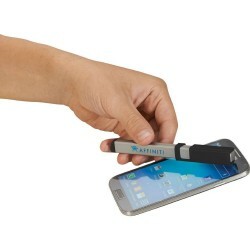 It works with most tablets and mobile devices, including the iPad and iPhone. 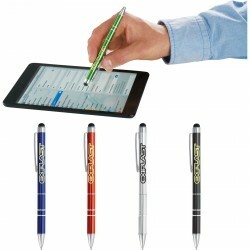 Stylus uses capacitive touch technology. 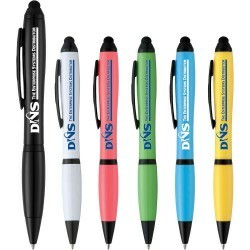 Includes premium blue ballpoint ink cartridge. 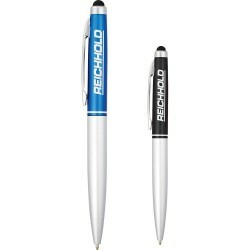 The Tech II Ballpoint Stylus combination pen gives you the best of both worlds – a traditional writing experience with our medium blue ballpoint ink cartridge and a stylus designed to work with most tablet computers and mobile devices, including the iPad and iPhone. 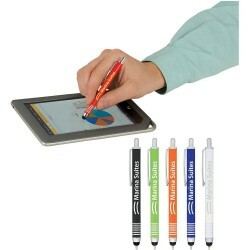 Stylus uses capacitive touch technology. Comfort rubber grip completes this style. 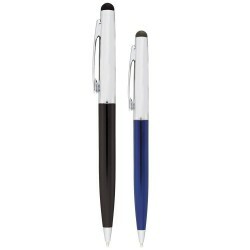 The Katon Dual Ballpoint Stylus combination pen allows for a premium writing experience. 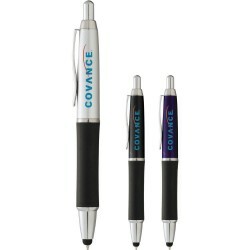 A clean, simple silhouette allows for comfortable use in both the retractable black ballpoint ink cartridge and the rubberized capacitive touch technology stylus tip, ideal for smart phones, including iPhones and iPads. 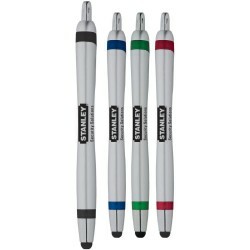 Spray rubber grip provides enhanced durability. 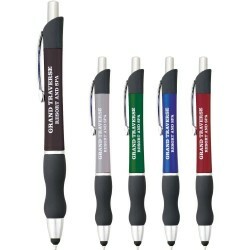 Soft rubber stylus tip is integrated into the end cap of pen and eliminates fingerprints and smudges on your device. Compatible with any capacitive touchscreen device including iPhone, iPad, Blackberry, and Android OS Tablets or Smartphones. Also ideal for any public touchscreen uses such as ATM or retail payment pads. 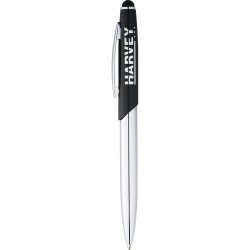 Classic design meets the new corporate needs in this dual ballpoint stylus pen. 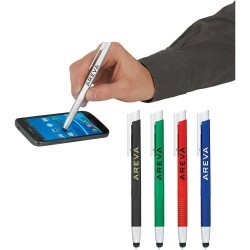 Soft rubber stylus tip is integrated into the end cap of pen and eliminates fingerprints and smudges on your device. Compatible with any capacitive touchscreen device including iPhone, iPad, Blackberry, and Android OS Tablets or Smartphones. 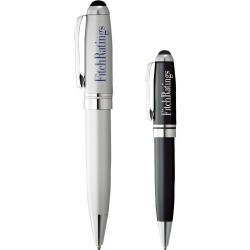 The Brookline Dual Ballpoint Stylus combination pen allows for a premium writing experience. 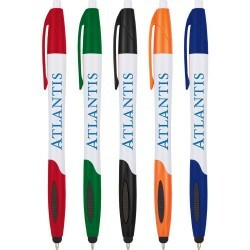 A clean, simple silhouette allows for comfortable use of both the retractable black ballpoint ink cartridge and the rubberized capacitive touch technology stylus tip, ideal for smart phones and tablets, including iPhones and iPads. 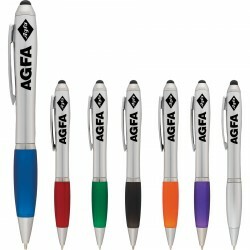 Retractable multifunction pen with a metallic finish barrel. 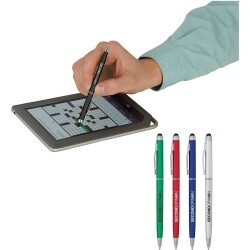 Has a stylus for use with touch screens and a very effective microfibre screen cleaner built into the clip. 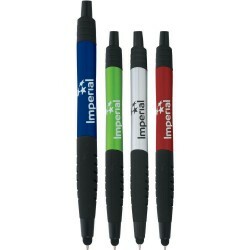 Has a black ink refill with 1200 metres of writing ink. Mini Bluetooth Speaker that offers excellent stereo quality sound and is compatible with all mobile devices that support Bluetooth. Has a wireless connectivity range of approximately 10 metres and can also be used with an audio cable. Will play music for 3-4 hours and is easily recharged from a laptop, power bank or USB mains charger. 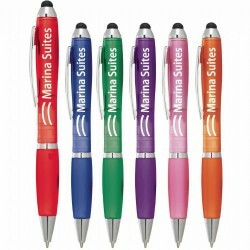 Retractable plastic ball pen with a soft touch rubber lacquered grip and clip. 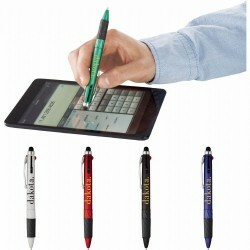 Has a built in stylus for use with touch screens. 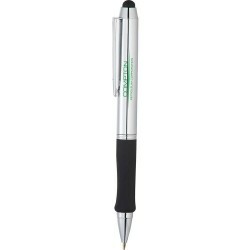 Retractable plastic and metal ball pen with a rubber grip. 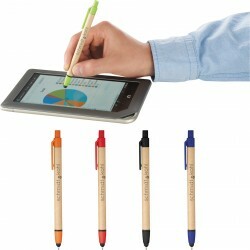 Has a built in stylus for use with touch screens. 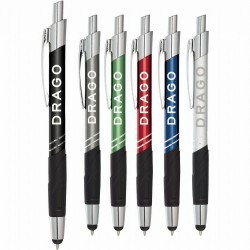 Twist action aluminium ball pen with a unique pearl finish barrel and a soft touch rubber lacquered grip. 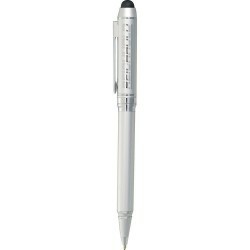 Has a built in stylus for use with touch screens and laser engraves to an Oxidised White colour. 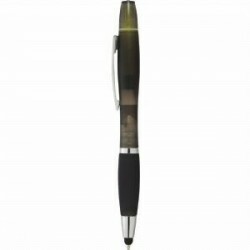 Luxury brass ball pen with a magnetic closure cap and plated finish. Has a black ink, metal Extra Large Volume refill with 2800 metres of wrinting ink. Laser engraves to mirror finish. 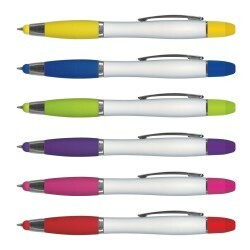 Twist action plastic and metal ball pen with a soft touch rubber lacquered grip. 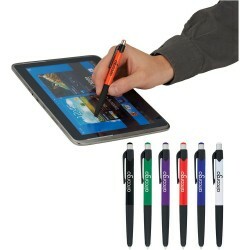 Has a stylus for use with touch screens and a black ink refill with 1200 metres of writing ink. 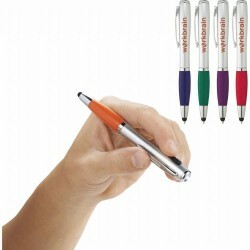 Twist action plastic and metal ball pen with a rubber lacquered grip and matching stylus for use with touch screens. 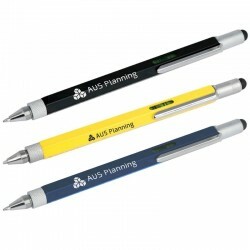 Has a built in yellow wax highlighter that will never dry up and a black ink refill with 1200 metres of writing ink. Twist action plastic and metal ball pen. 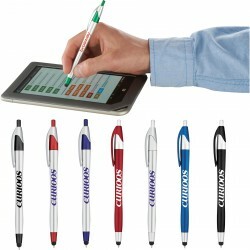 Has a stylus for use with touch screens and a black ink refill with 1200 metres of writing ink. 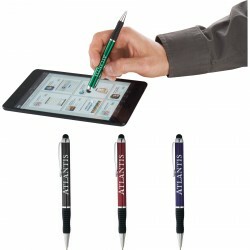 Twist action aluminium pen with a stylus for touch screens. 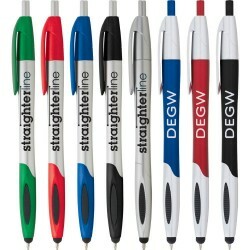 Has a black ink refill with 800 metres of writing ink and laser engraves to an Oxidised White colour. High gloss upper barrel with rubberized grip. 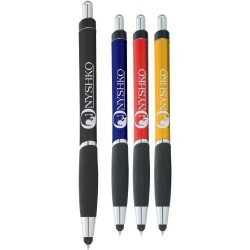 Pen includes premium black ballpoint ink cartridge and stylus tip. 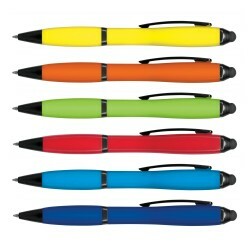 Rubberized stylus tip is ideal for touch screens, including iPhones and iPads, as well as retail payment pads. 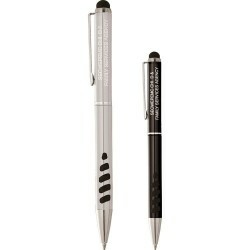 Vice-Versa Dual Ballpoint Stylus Unique design allows you to utilize the stylus or ballpoint with the flip of a cap. 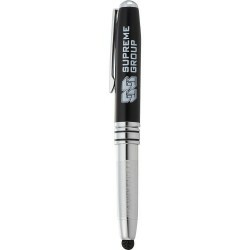 Cap detaches to reveal black ink ballpoint pen and snugly fits onto either side of the pen for full performance of either function. Soft conductive rubber tip acts like your finger and eliminates fingerprints and smudges. 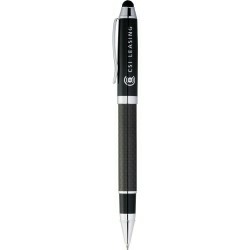 Luna Roller Ball Stylus High gloss black enamel upper barrel with carbon fiber detailing in lower barrel. 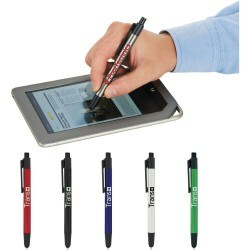 Rubberized stylus tip is ideal for touch screens, including iPhones and iPads, as well as retail payment pads. 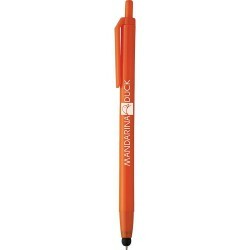 Monroe Ballpoint Stylus Classic design meets corporate needs in this dual ballpoint stylus pen. 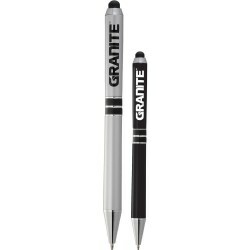 Soft rubber stylus tip is integrated into the end cap of the pen for use on touchscreen devices including iPhone, iPad, Blackberry and Android OS tablets or Smartphones. Also ideal for ATM or retail payment pads. 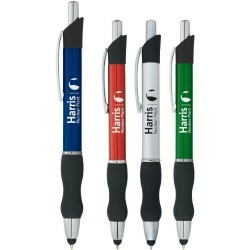 Includes premium blue ballpoint ink cartridge. 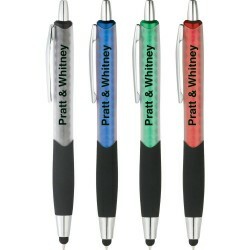 Colour Pop Ballpoint Stylus Unique shiny chrome barrel cutouts reveal Colour pop lower barrel accents. 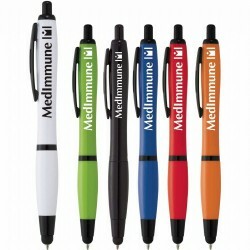 Pen includes premium black ballpoint ink. 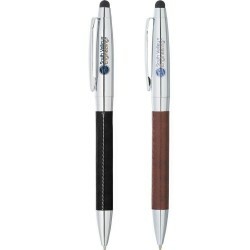 Abruzzo Ballpoint Stylus Exclusive Leed''s design. Vinyl wrapped bottom barrel with shiny chrome upper barrel. 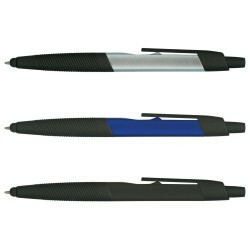 Soft rubber stylus tip is integrated into the end cap of pen and eliminates fingerprints and smudges on your device. 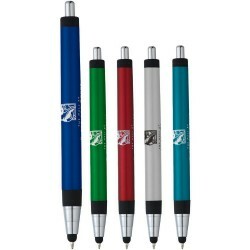 Contour Grip Ballpoint Stylus Metallic barrel with ergonomic rubberized comfort grip. Chrome accents. 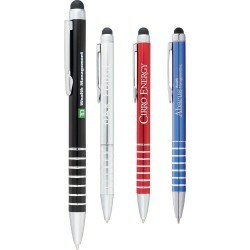 Pen includes premium black ballpoint ink cartridge. 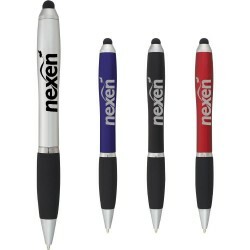 Retractable ballpoint pen with soft rubber stylus for touch-screen devices. Media device not included. Sophisticated silhouette features matte upper barrel with shiny chrome lower barrel and accents. Premium black ballpoint ink cartridge. 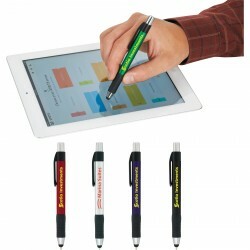 Rubberized stylus tip is ideal for touch screens, including iPhones and iPads, as well as retail payment pads. 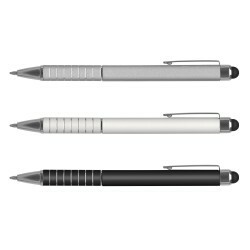 Sleek in design and powerful in function, the Dickson Ballpoint Stylus is your go-to classic ballpoint with rubberized stylus end tip. 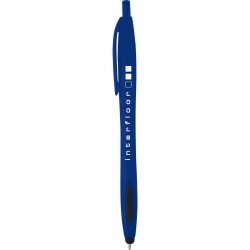 Twist action mechanism with blue ballpoint ink cartridge. Includes velvet pouch. 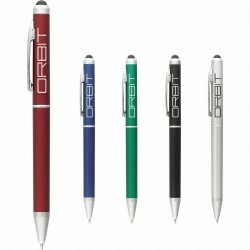 The Liberty Ballpoint Stylus combines a classic ballpoint with an added stylus function in a rich collection of Colours. Textured grip enhances your writing experience. Click action mechanism with black ballpoint ink cartridge. Includes velvet pouch. Triangular-shaped barrel. 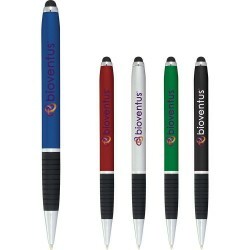 Retractable ballpoint pen with soft rubber stylus for touch-screen devices. Twist-action ballpoint pen. 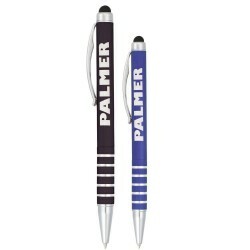 Twist grip to choose between the 2 ink Colour options: Black or Blue. 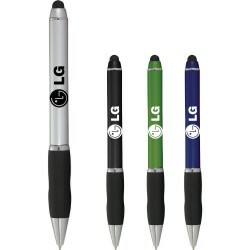 Includes soft rubber stylus for touch-screen devices.